When you find yourself growing and finding success faster than you can keep up with, SPS Commerce will save your life and your reputation. The services they offer are easy to understand, they are available with suggestions and ideas for better ways, personalization is available to best suit your needs or the needs of your customers so that you can really shine and relieve the worries that come with growing pains. SPS also helps to keep information accurate with less human touching to cause errors. I wish they had an online chat option in a timely manner for quick help rather than email and phone calls. We reviewed many, SPS Commerce Fulfillment was the best "bang for our buck" with the level of growth we have been experiencing. The list of services they offered were exactly what we needed to be able to move our business to that next level of professionalism where we were growing faster than we could prepare ourselves for. Positive - We have been able to keep up with demands set by our customers by using SPS which builds trust between us and them. Positive - We are able to avoid charge-backs with more automation available to us with SPS to keep up with requirements and time frames. 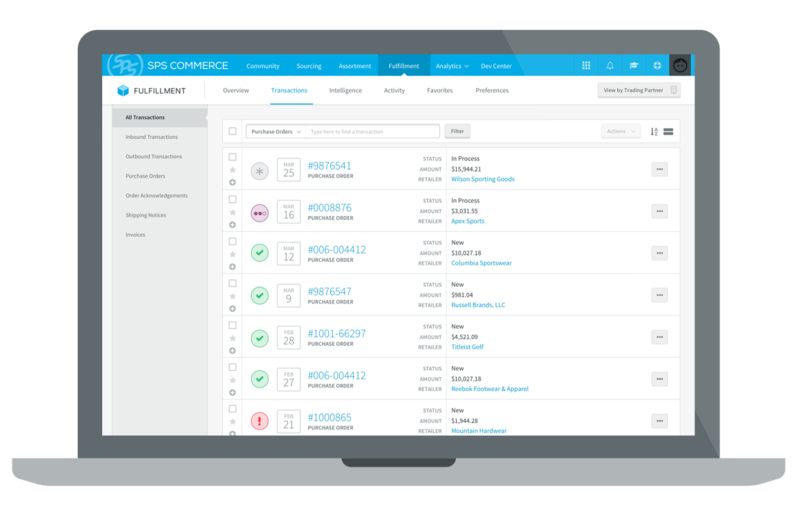 SPS Commerce Fulfillment provides real-time visibility to order and shipment statuses.